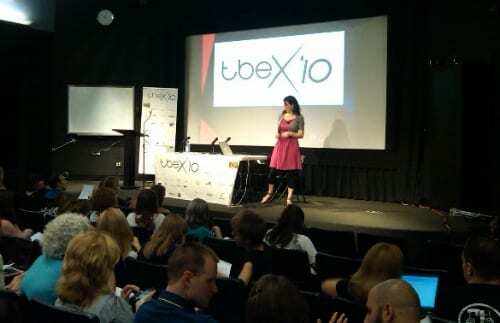 As TBEX matures out of infancy and into its toddler years, I’m struck by all the new faces I see at each conference. There are a few people who have been to every single TBEX so far, but I imagine that number will shrink fairly quickly from here on out. Because of that, I wanted to make sure we’re doing a good job of talking about not just the latest or next TBEX but also chronicling where we’ve been and how far we’ve come – especially while looking in the rearview mirror back to Chicago in 2009 isn’t too much of a strain yet. Toward that end, I’d like to invite those of you who have TBEX memories from any past conferences to submit them to the TBEX blog. We’ll take photos, brief stories, or a combination of the two. Let’s keep a storytelling tradition alive internally, shall we?, so that when we talk about storytelling at conferences we’re walking the talk. I remember following the progress of the TBEX Road-Trip as it snaked from Seattle to Chicago. I kept waiting for the road-tripping trio – who, if I remember right, hadn’t met before they agreed to drive cross-country together – to implode. Not only did the experiment not fail, Pam, Kelly, and Peter remain good friends to this day. I remember a stuffy room with giant windows on two sides packed with travel bloggers who could have complained endlessly about the heat, the cramped seating, and probably a bunch of other things, but who were just so happy to be there. I remember walking to an outdoor cafe when it was all over and having drinks with a few bloggers who came along, at what was probably one of the first TBEX after-parties (albeit an incredibly low-key one). I remember meeting, for the first time, so many of the bloggers I’d “known” online for what seemed like ages. It was overwhelming, seeing all these moving avatars in one room. I remember a two-day schedule, twice as many speakers, and a wide variety of topics made it feel like TBEX had really grown up. I remember being surprised at how articulate Gary was onstage, since his speech came before my learning of his debate club days (not to mention his general affinity for talking in front of a microphone). I remember the World Cup going on during some of the sessions, including my own panel, which meant that a kind soul in the front row had to alert me when someone scored and I may have scared Annemarie by yelping in her ear at the news. I remember Mike donning a powder-blue polyester suit (with flip-flops), nevermind that it was a thousand degrees. I remember a party upstairs in a cool old building where the music was too loud (though many didn’t seem to care) and where a vuvuzela was making the rounds (because the music apparently wasn’t loud enough). I remember meeting, for the first time, even more people I’d only “known” online, and still feeling excited about the connection. I remember a road-trip from Portland to Vancouver in a rental car that could not have held another ounce, a delayed flight that meant I got a brief catnap in a Sea-Tac restaurant parking lot, and a Canadian border guard who gave the most grief to the sole Canadian in the car. I decided not to point out that we were actually returning her, so he should cut us some slack. I remember putting too many people in an otherwise splendid hotel room. I remember finding a Vancouver hockey jersey on my bed, a garment that could have easily fit three of me. I remember the gorgeous building where the conference was held – soaring floor-to-ceiling windows on one side and actual break-out rooms – and felt like TBEX had really grown up. 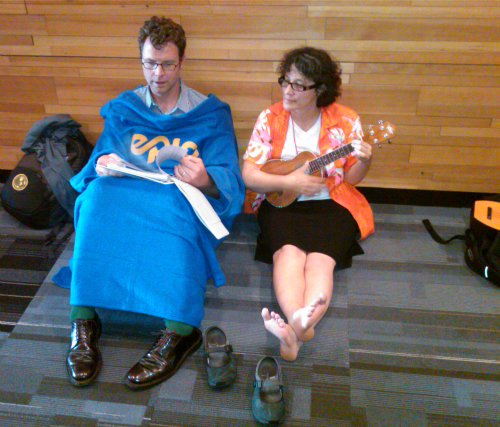 I remember a ukulele jam session with Pam and Spud in between panels, and then later Pam playing the uke while Andrew (clad in a Slanket of some kind) sang along. I remember Robert telling us all to pick up the phone, already, and do some fact-checking. I remember being almost alarmed at the sheer number of people in attendance, wondering where all these travel bloggers had come from, before having that familiar and welcome experience of meeting so many of those “oh, I know you!” avatars for the first time. Yes, there’s a theme here. I never tire of meeting TBEXers for the first time, of seeing that little Twitter avatar smiling at me in real life and life-size. Shaking hands and getting hugs from people whose voices I’d never heard before that moment (but who I feel like I’ve known forever) never, ever gets old. What are your TBEX memories? What snippets stand out for you – without looking back at posts you may have written at the time? We want to hear them. Send in your TBEX memories to jessica@tbexcon.com with the subject line “TBEX Memories” and we’ll share them on the TBEX blog. Look at that photo from 2009! Memories…. Or, rather, convincing as a conference receptionist capable of answering to “WHERE’S THE COFFEE” with knowledgeable ease.